- Type "1" Ambulance built in 2018 on a 2018 Dodge Ram 4500 4x4 with a Brawn Northwest Box. - Aid-2-1 is the first out due ambulance for the department. 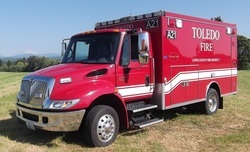 - Type "1" Ambulance Built in 2007 on a 2005 International 4300 Chassis by Braun Northwest. - New Stryker "Stair Chair" with treads for sliding the chair down stairs instead of carrying. Aid-2-1 is the departments second due ambulance on all aid calls. It is first due in the winter when ice or snow is in the forecast. The custom "Box" is the largest that Braun Northwest builds. The back of the ambulance is on an air-ride suspension that squats when the back doors are opened to provide easier access for loading and unloading patients. Aid-2-1 also responds to fires for rehab of firefighters to ensure their safety. - Type "3" Ambulance mounted on a 1998 E-350 Chassis built by Wheeled Coach Inc.
- Aid-2-2 is the third due ambulance for the department. - 120 GPM @150 PSI Hale Pump w/ 18 HP Briggs and Stratton Engine. Brush 2-1 was build in 2008, the second Wildland engine built in house by District 2 personnel. It responds to wildland/brush fires and other incidents as needed. It is the second truck built by District 2 to meet the increasing need for response to wildland incidents. - 2008 Type "6" Wildland Engine, Custom built in house on Ford F-550 extented cab Chassis. - 120 GPM @ 150 PSI Hale Pump w/18 HP Briggs and Stratton Engine. Brush 2-3 was built in 2007 to meet the needs of a Wildland engine to be used for State Mobilization to large fires on the East side of the state and beyond. This engine is stocked to be self sustaining for the first 72 hours of a Mobilization if needed as Wildland incident can evolve rapidly. Engine 2-1 is the departments first due engine on all structure / vehicle fires and auto accidents. The Cab seats 4 with 3 seats holding SCBA's/ The engine has a large compartment of various size hose and hand tools for fire supppresion while also carrying all the extrication equipment (Two sets of Jaws, Air Bags, Stabilization Struts, Hand tools) needed at any auto accident scene. - 1994 Western States "Type 1" Pumper built on a Freightliner FL 80 Extended cab Chassis. Engine 2-2 is the departments second due engine for structure / vehicle fires. The cab seats 5 with 4 seats holding SCBA's. The engine is mainly used for structure / vehicle fires as needed and does not carry any extrication equipment. - 2003 Fouts Brothers Manufacturing, Type "2"
- Tender built on a Kenworth Chassis. Tender 2-1 is currently the only tender in service for District 2. Responds to all structure, vehicle and Wildland fires for water supply. Carries extra 1 3/4' and 2 1/2' hose to extend attack lines. The MCI trailer would be dispatched to an emergency with a large number of injured people. It contains 20 backboards and enough trauma supplies to treat 50 people. It can be towed by either the utility pick up or by Brush 2-1 to any requesting District. - 1939 Dodge Fire Engine is currently located at Tucker Rd Station. - Sold to a private citizen in the early 70's when newer trucks were being purchased by the city. Returned to Toledo, Summer of 2006. Owner of the truck approached the district and wanted to know if we would like to buy it back. The Volunteer Association purchasd the truck and is now in the process of restoring the fire truck.